You will doubtless find many people who don’t like vegetables, but few of that group who don’t like potatoes. I mean, what’s not to like about a potato? It’s inexpensive, nutritious, and so incredibly versatile, that you can use it to make all kinds of dishes from snacks and appetizers to breakfast dishes to main dishes, breads, and even desserts. This is an easy way to deal with the buttery deliciousness of Melissa’s Dutch Baby Yellow Potatoes. I don’t know anybody who doesn’t like these, and I have served them at brunch as well as at dinner. They also make a great finger food when you’re serving nothing but snacks. They pack a lot of flavor for such a small amount of work. I used this meat mallet to flatten the potatoes and it worked very well (Don't get overzealous or you'll mash them to bits.). Place potatoes and kosher salt in a large saucepan of water. 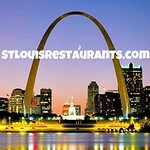 Bring to a boil and simmer for 15 to 20 minutes until the potatoes are tender when pierced with a fork. 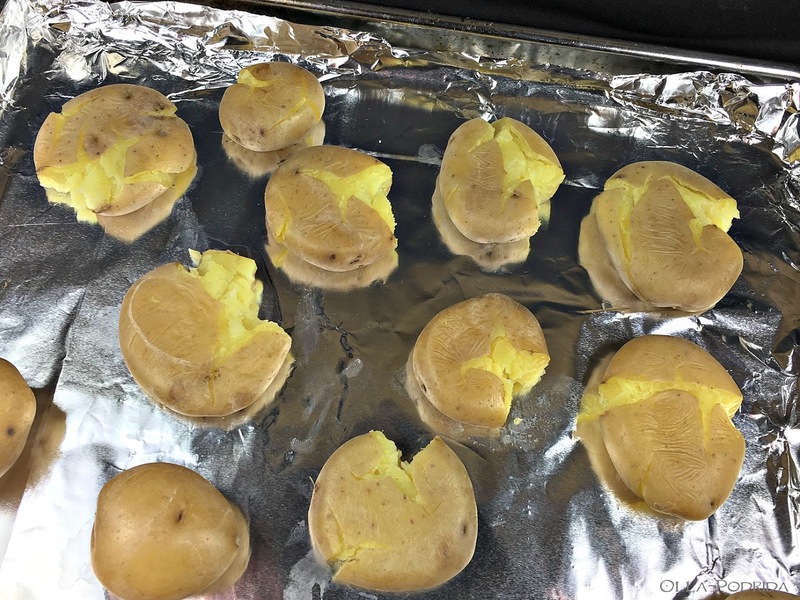 Drain potatoes and place on a foil-lined sheet pan. With a potato masher, press each potato until it's about ½" thick. Be careful, or you’ll make a right mess. Toss potatoes with the olive oil, Malt & Vinegar Salt, and lots of pepper. Roast for 25 to 30 minutes, turning once, until the skins are crispy. 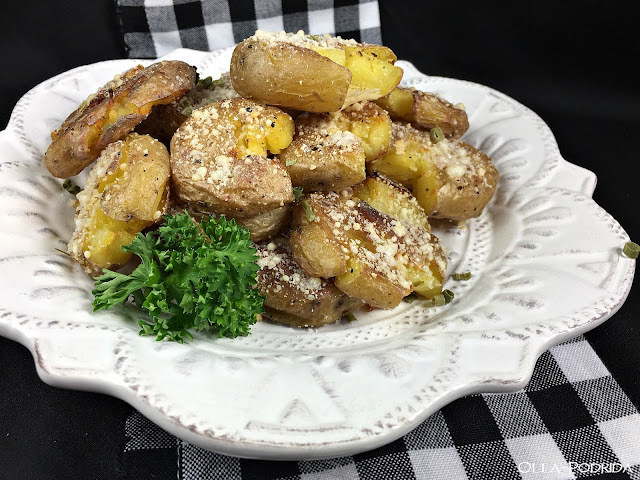 Sprinkle the potatoes with bit more salt and dust with Parmesan. Roast for another 2 to 3 minutes until the cheese is hot. Serve them with sour cream, ranch dressing, chopped chives, chopped scallions, applesauce, and extra salt, and a bottle of Malt Vinegar. These are so good that it’s hard to stop eating them, so you might want to make a double or triple batch. *I got this from Williams-Sonoma. 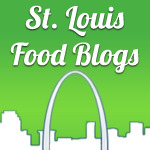 If you don’t have one near you, you can buy Malt & Vinegar Powder and add sea salt of your own. If you prefer potato chips, you can make your own. See the recipe here. 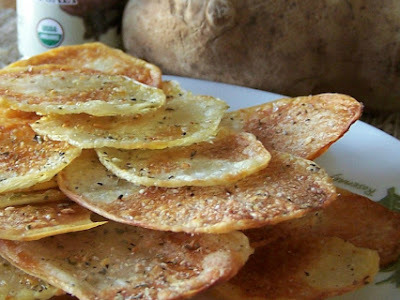 Well I love salt and vinegar potato chips, so I know I'd love these. They look fantastic, especially with that sprinkle of Parmesan! I just made smashed potatoes over the weekend - my sweetie loved them so much!! I never heard of malt and vinegar salt...sounds interesting! 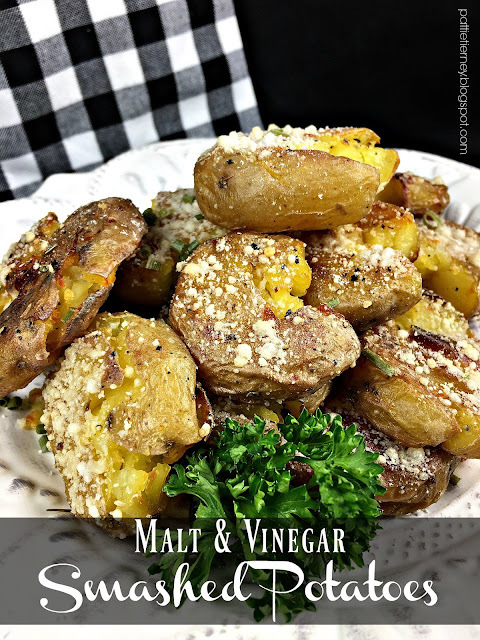 I've made smashed potatoes many times but am loving the idea of malt and vinegar salt! Great idea!